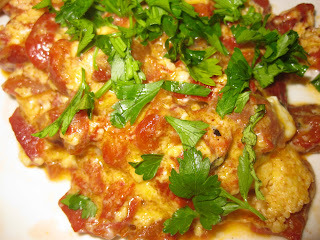 I made the original, very traditional mish-mash, roasted peppers, feta cheese and eggs. 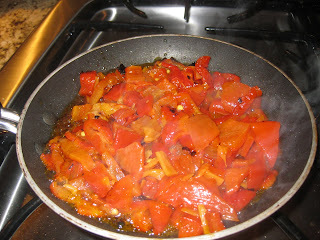 First, I sauted the roasted peppers in two tbsp olive oil to evaporate the juices. 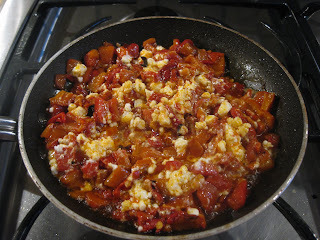 Then I added Feta cheese and two eggs. 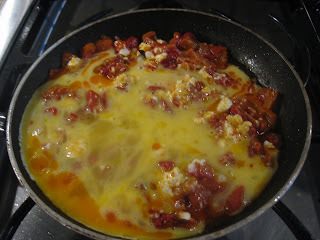 When the cheese started to melt I added the eggs. 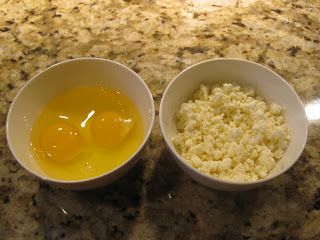 Carefully mixed the mish-mash, not to overcook the eggs. Sprinkled with parsley. Bon Appetit! Tonight's TV - Weeds, season 5. What kind of peppers are these? I need to buy some...What would also be good in here is some sharp cheese ( I strongly recommend the pecorino / parmigiano shredded mix from Costco) and sun dried tomatoes (Costco again). I buy roasted peppers from TJ, or International Food Bazaar (IFB) http://www.yelp.com/biz/international-food-bazaar-san-jose. In IFB, they come in large jars - $5-6$, usually imported from Bulgaria.